Now about that accumulation of snow and ice - Viv cited some buried WWII aeroplanes in south east Greenland, and Mawson and Colbeck Huts in East Antarctica. Well, there has been a lot of snow in the normally dry East Antarctica in recent years and around Colbeck Hut in particular. And south-east Greenland is reported as the spot where "snow accumulation is the highest in Greenland" The fact that snowfall may be increasing in some areas could be a sign of a more humid atmosphere. 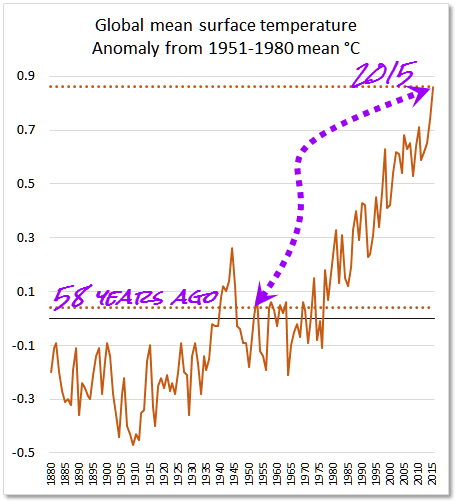 It most certainly is not a sign that the world is cooling. Despite the fact that most, but not all, Himalayan glaciers are shrinking, Viv claimed the opposite. He's an inveterate liar. 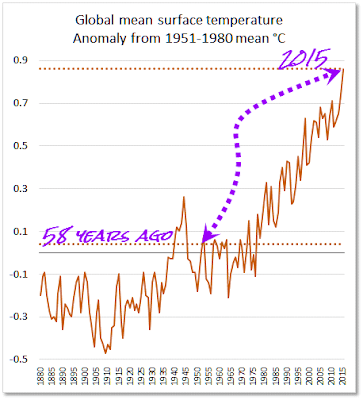 A lot of Viv's article was just links to nonsense on other denier blogs, like his claim that the world hasn't warmed in 58 years. His source? Arch disinformer "Steve Goddard" who specialises in falsely accusing scientists of faking data. Sheesh! See for yourself. The chart below shows that 58 years ago it was more than 0.8 °C colder than it was last year. There were not a lot of comments at the time of writing. A bit of argy bargy between the different camps but nothing that added any value that I could see. Time will surely tell, and if the world goes into a cooling spell , there will be plenty of people who said ‘I told you so’. John F. Hultquist wonders why the article was written as a Letter to the Editor. The only editing at WUWT is comment editing, not article editing. Viv Forbes — what is this a response to? commieBob is delighted to find a prediction he likes, instead of the predictions of more warming to come. Here are some others he'll enjoy. None of them look like eventuating either. Lordy. Let’s hope this letter, with its main inyourface picture of solarcyclomania and statement that everythingcauseseverythingmechanism rides the road to the bottom of the webpage in a hurry. Embarrassing. I've tried that one many times. It seems to fly right over the collective heads of denier types. "Why was there no mobile phone footage of the plane as it approached the pentagon"
From memory proably along the lines of "why was there no cartoon like plane shaped hole in the side of the pentagon "
Sou, please consider a Facebook page as well. Just copy and paste all articles. This is a wonderful resource. I am sure a few here would volunteer as admin to keep the rabble out. John and Bill, I tried Facebook some time ago and gave up in frustration. One thing on the internet that I cannot stand is Facebook. It's an affront to bloggers everywhere. My main complaints are - it is the most unintuitive website that I've ever come across; it doesn't respect privacy; it is Kludgy with no formatting options I can find; and it is overly intrusive. It is not merely overly intrusive, it is abusively intrusive. However given that some people seem to use it a lot I might give it another try. I'll waste a few more hours with it. If at the end of that time my irritability quotient is above 500, I'll stop. If I can get it to do 5% or more of what it should, I'll let you know and add it to the sidebar. Okay - HotWhopper is now up on Facebook FWIW. It will need some likes to get anywhere, I believe. Coal industry executives are a desperate lot. And getting ever more desperate. I just love how he pretends that these things are NOT being studied, and that it doesn't occur to his credulous fans that the reason he knows about them in the first place is because such things ARE studied and NOT ignored. As for Milankovitch cycles predicting an imminent ice age, well, that's pretty much a howler if one takes the time to understand this graphic.